Dangerous levels of climate change could be reached in just over 20 years if nothing is done to stop global warming, a WWF-UK study claims. At current rates, the Earth will be 2C above pre-industrial levels some time between 2026 and 2060, says a paper by Dr Mark New of Oxford University. Temperatures in the Arctic could rise by three times this amount, he says. It would lead to a loss of summer sea ice and tundra vegetation, with polar bears and other animals dying out. It would also mean a fundamental change in the ways Inuit and other Arctic residents live. Dr New said: "A very robust result from global climate models is that warming due to greenhouse gases will reduce the amount of snow and ice cover in the Arctic, which will in turn produce an additional warming as more solar radiation is absorbed by the ground and the ocean." Ice and snow reflect more solar radiation back to space than unfrozen surfaces. According to the WWF, the perennial ice, or summer sea ice, is currently melting at a rate of 9.6% per decade and will disappear completely by the end of the century if present trends continue. Boreal forests would spread north and overwhelm up to 60% of dwarf shrub tundra, a critical habitat and vital breeding ground for many birds. "If we don't act immediately, the Arctic will soon become unrecognisable," said Dr Catarina Cardoso, head of climate change at WWF-UK. "Polar bears will be consigned to history, something that our grandchildren can only read about in books." 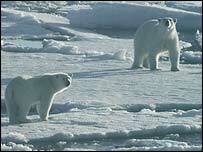 Dr New's paper - Arctic Climate Change with a 2C Global Warming - is one of four papers contributing to a report by WWF. The papers will be presented at the Avoiding Dangerous Climate Change conference in Exeter between 1 and 3 February. The conference has been organised by the UK's Met Office.